The land that surrounds the Morro Bay estuary is contoured by hills and valleys, studded with trees, and etched by creeks that take their time winding down to the salt marsh and entering bay. In short, it is a beautiful place that offers many opportunities to get outside and explore. But, as summer winds down, students head back to school, and the sun starts to set earlier in the day, many of us spend more time inside than out. Studies show that making time to enjoy the natural spaces around us by hiking, walking, or even just visiting with friends in green spaces can improve your mood and decrease stress. So, even when the classroom, the office, or housework or other projects are keeping you busy indoors, you might want to schedule time in nature. 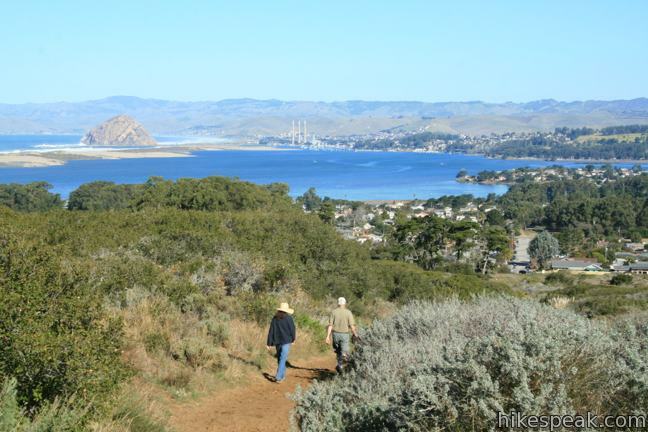 To help you get outside this fall and beyond, we’re sharing some fun hikes that are close to home in the Morro Bay watershed. This 2.6 mile lollipop-loop starts at the end of Broderson Avenue in Los Osos. It brings you up over ancient sand dunes covered in sage and other vegetation, and ends at an overlook where you can catch your breath along with a panoramic view. On a clear day, you’ll see Morro Bay and Morro Rock, the Elfin Forest, and Montaña de Oro’s Hazard and Valencia Peaks. The Monarch Grove trail is about one mile long and relatively flat, making it a great spot to hike for families with small kids or dogs. A video of the monarch grove in Los Osos. Video by HikeSLO via Youtube. It’s a nice walk throughout the year, but it comes alive in late October when the monarch butterflies return. Look up quickly, and you might see what looks like a lot of leaves fluttering on branches in the breeze. Look closely, and you’ll see that those leaves are actually the undersides of hundreds of butterfly wings. 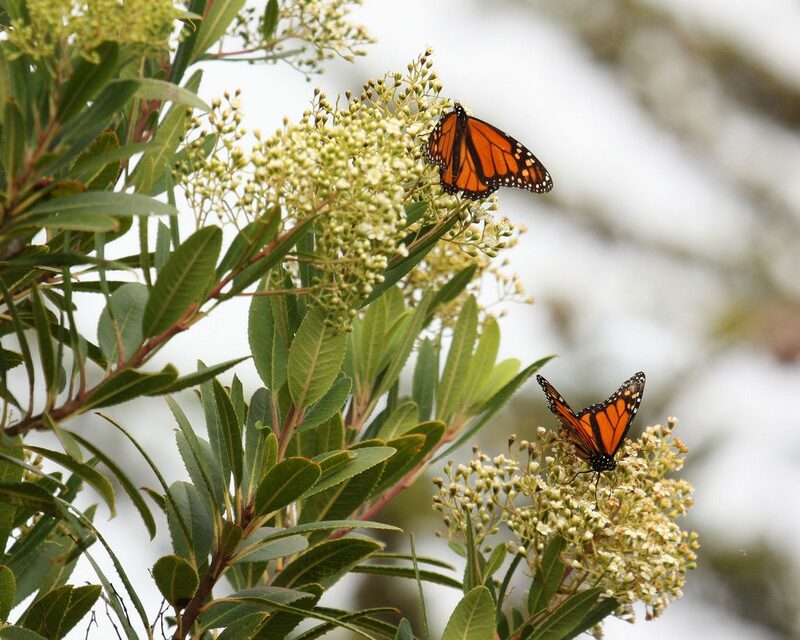 Monarch butterflies spotted in Los Osos, California. Photograph courtesy of Sandy/Chuck Harris via Flickr Creative Commons. 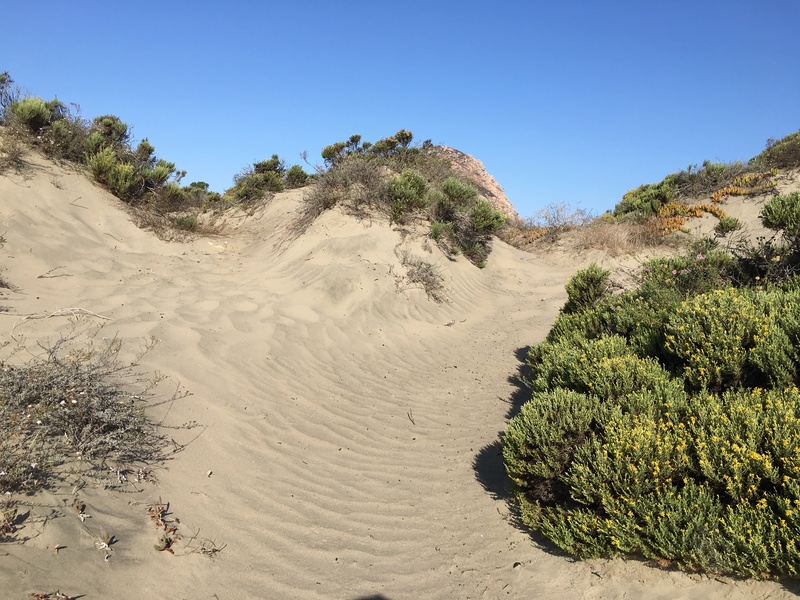 Hiking the Morro Bay sandspit can be an all-day nine-mile affair or a quick jaunt amidst the dunes. This out-and-back hike begins in Montaña de Oro at Sandspit Beach. From there, you can park your car and hike as far as you like. The minute you head down the hill to the beach between the tall dunes you’ll get a whole new perspective. Make sure to check out both the estuary side of the sandspit and the ocean side. Keep an eye out for osprey circling, pelicans diving, and shorebirds searching for food beneath the sand. This windblown path wends its way through the dunes. You’ll also find beautiful shells, rocks, and even bones of birds and other wildlife. Take as many photographs as you like, but please leave all of these natural treasures in place. 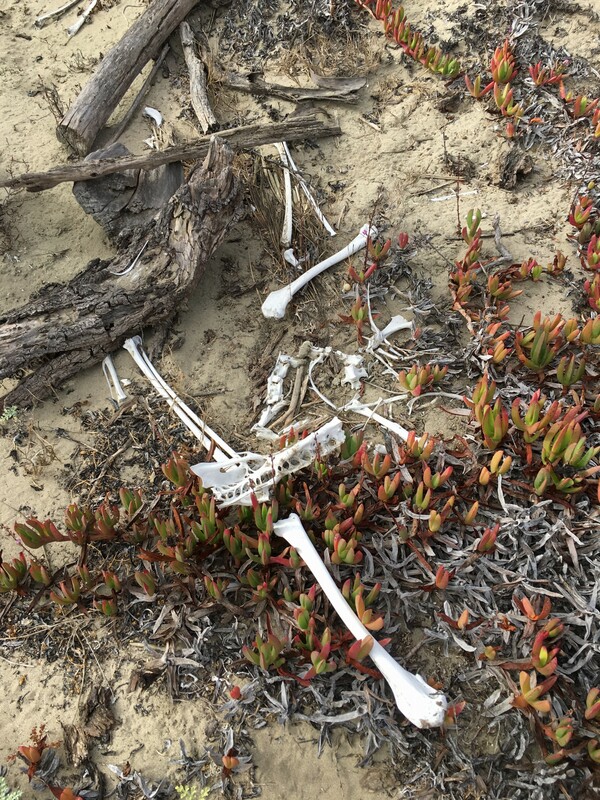 You might find bones, shells, and other natural treasures along your sandspit hike. Please leave them there for the next adventurer to admire. Consider photographing any animals and plants you see and adding them to the Morro Bay National Estuary Program’s Biodiversity project on iNaturalist. This one-mile boardwalk trail takes you through a pygmy oak forest and a variety of other native habitat types. Kids and adults will feel the magic of the Rose Bowker Grove, which offers two benches where you can rest beneath the bows of the pygmy oaks. You’ll also find two viewpoints that overlook the estuary. 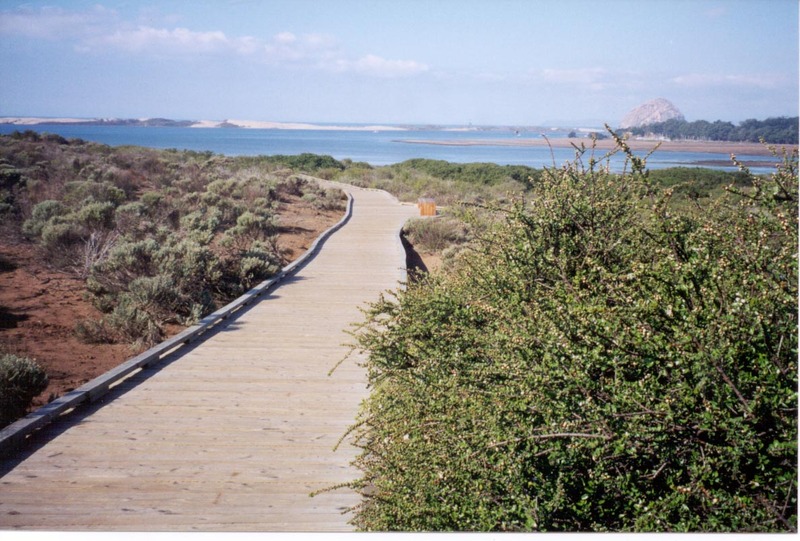 The boardwalk path through the elfin forest winds through eight different habitat types, and offers beautiful views of the estuary. SWAP (Small Wilderness Areas Preservation) maintains the forest, and offers some docent–led walks and talks on the third Saturday of each month. 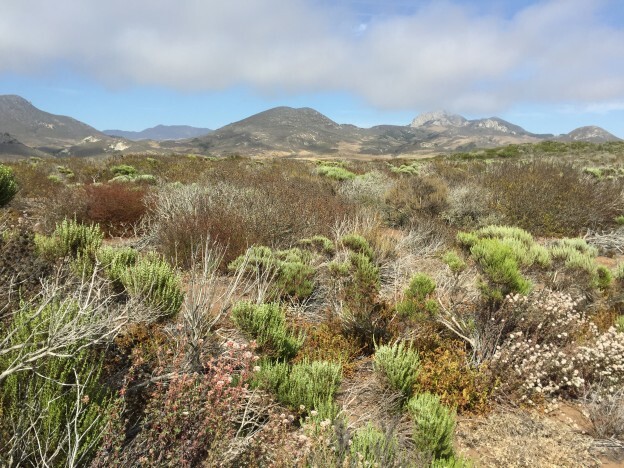 You can see what’s coming up next, or to find driving directions, visit SWAP’s El Moro Elfin Forest website.